يقع فندق Kelly's Beach Resort، المصمم ليناسب كل الضيوف سواء كانوا من رجال الأعمال أو السياح، في مكان ممتاز في أحد أكثر المناطق تفضيلاً في بارجارا. يجذب هذا الفندق ذو 3.5 نجوم، والذي يبعد 3 km فقط عن وسط المدينة و 20 km عن المطار، الكثير من الزوار سنوياً. إن سهولة الوصول من الفندق إلى المعالم السياحية الشهيرة الكثيرة في المدينة كمثل ‪Mon Repos‬, The Barrel هو استثنائي بحد ذاته. استمتع بالخدمات الراقية والضيافة التي لا مثيل لها بهذا الفندق في باندابيرج. يمكن الاستمتاع بمجموعة من الخدمات على أعلى المستويات في الفندق كمثل واي فاي مجاني في جميع الغرف, مرافق مخصصة لذوي الاحتياجات الخاصة, واي فاي في المناطق العامة, صف السيارات, التوصيل من وإلى المطار. في الفندق غرف نوم يتجاوز عددها 40، كلها مجهزة بعناية وجمال وبعضها مزود بـ تلفزيون بشاشة مسطحة, غرف لغير المدخنين, مكيف هواء, تدفئة, شرفة/ تراس. يمكنك طلب اللائحة الكاملة للخدمات في الفندق ومن بينها حوض استحمام ساخن, ساونا, مسار جولف - ضمن 3 كم, حمام سباحة خارجي, صيد السمك. إن Kelly's Beach Resort هو خيار ذكي بالنسبة للمسافرين إلى باندابيرج، بما يوفره من إقامة هادئة ومرحة. Great value for money. Stayed for the weekend a few months back for a family gathering and very much enjoyed our time despite the rain. Property was clean, quiet and conveniently located just back from the beach. Kids were thrilled with the loft, and the bearded dragons hiding in the garden beds. We usually stay on the main promenade when in town but will certainly come back to Kelly's Beach Resort again, and hopefully soon! Hi there Donna, Thanks so much for taking the time to provide us with feedback on your expereience here at Kellys :) We truly appreciate it! We are so happy you guys made the most of the rainy weather and still managed to enjoy all the resort offers. Those cheeky dragons are everywhere :P We look forward to welcoming you back another time! 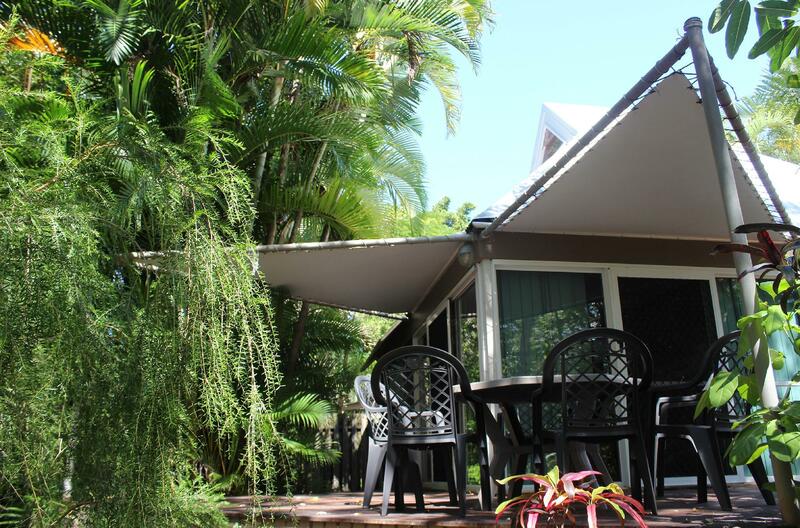 We loved staying here and we did the Mon Repos Turtle rookery, great for the family, the villa was spacious and comfortable. Staff were super helpful, a great place to stay! Very near to Mon Repos to see turtle hatchings. Lots of beaches, shops, cafes etc. Bathrooms need an upgrade as do the verandahs. You're paying for accommodation BUT.. there are a list of 'to do' cleaning before you leave. We really enjoyed the quiet and pleasant environment at Kellys Beach Resort. It is secluded and family friendly. Maybe could do with some maintenance but otherwise good stay. Just best not to expect the Ritz. Poor location old and dingy. nice gardens and the kids loved the movie nights held in the garden during the evening. I stayed at this property approx 25 years ago & not much has changed! the resort could do with a makeover. Villas are quite small, especially kitchen area, bathroom & toilet. and especially if meant to sleep 8 people. Rooms were also quite dirty & felt unclean. I had to put a blanket over the lounge to cover it. Windows were hard to open or wouldn't stay open. the loft area in my villa had a very strong urine smell & carpet was very unclean. I wouldn't allow my kids up there! the pool was very dirty with lots of 'floaties'. General surrounds of grounds need a good trimming back - there was a snake skin in the tree off my balcony. most likely won't return again. I really enjoyed my stay at Kellys. The facilities were great and the staff were very attentive. It was very relaxing sitying on our porch looking at the grounds of the resort. 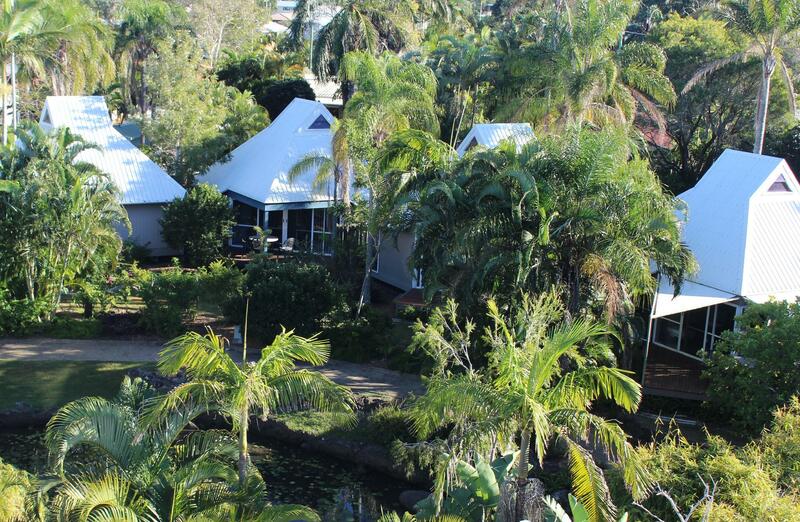 I will be back to stay at Kellys next time I am in Bundaberg. The Staff, The Location, Well equipped kitchen. I took my mother & father, in their 70s (me 40's) On the ground floor there is 1 bedroom with a double bed & 1 bunk bed. Up in the loft (steep ladder) there was another double bed with 2 single mattresses on the floor. I slept in the bunk bed down stairs as I wasn't game to sleep up in the loft & climb down the ladder in the dark. The cabin is self contained with microwave, fridge, tv, dvd player, saucepans cups etc and you will need to take your own tea,coffee,milk,sugar etc if you are staying a couple of days as they don't refill. Laundry is done on the 4th day only. The grounds are lovely, great pool with a spa + lounges etc & the restaurant menu looked great although we didn't eat there. 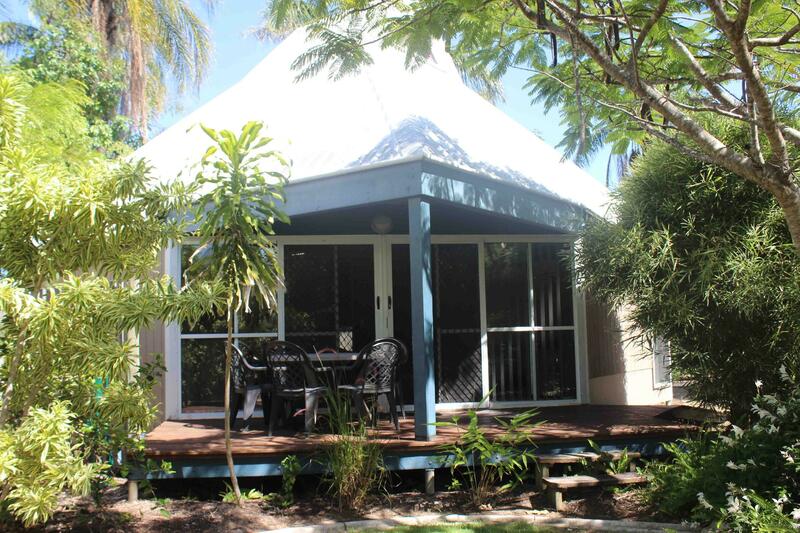 It is only 1 street back from the beach, but Bargara main town is a 5 minute drive or 40min walk. We had a lovely stay but next time I would stay closer to town purely for convenience. Note they do not have free wifi, they charge $7.50 per day or $40 per week.. That's a bit steep considering most hotels now offer free service, which is great for travellers who are looking to plan touristy stuff on their holidays. Peaceful and relaxing. Car parking next to villa, walking distance to beach, room airconditioned with good size fridge. Bathroom quite small however rest of villa great size. The stay was fine. I enjoyed the green gardens around the bungalow and the bed was so much more comfortable than I was expecting. There were lots of dead ants and other bugs in the unit so am not sure when it was last cleaned. The area was very quiet at night but mostly families with young children during the day so may not be the best place for singles. I was in meetings during the day so it suited me fine. Was short walk or drive to a lovely nearby beach. i stayed with my family of 4 in a cabin. rooms were clean and they had a toilet and a shower room. there is a attic in the cabin where the extra beds are and this resort is definitely children friendly as you have heaps of activities to do like swimming, cycling ,snorkeling,tennis,etc. families with children will love kelly's! highly recommended to anyone planning a trip to bundy! . the resort is located 10 mins away from the cbd.